One of the most fun parts about being a mom is making school lunches. It can also be one of the most frustrating. One day you feel inspired and creative, making meals you can't wait for your kid to find in hislunch box; the next day you're banging your head against the wall because you feel like a failure for preparing the same boring thing day after day. One of the things I find kids love most about the surprise of opening their lunch box isn't just how the food will taste, but also how pleasing it is to their eye. Just making everything look good can have a big effect on your kid's excitement level. I always try and pay attention to how Kenya and Chloe's lunch will look to them the first time they see it. As many of you know, I'm a major fan of the Planet Box lunchbox because it has several compartments, each of which you can fill with a different culinary treasure for your little one. But you don't need a cool lunch box to make a good impression. For example, I love giving Chloe sandwiches, especially healthy tuna fish sandwiches, but let's face it, after a few days even sandwiches can quickly lose their appeal. Still, I think it's a wholesome school lunch, so I thought of ways to put a cool visual spin on the same old same old. The result was these "sushi" sandwiches. 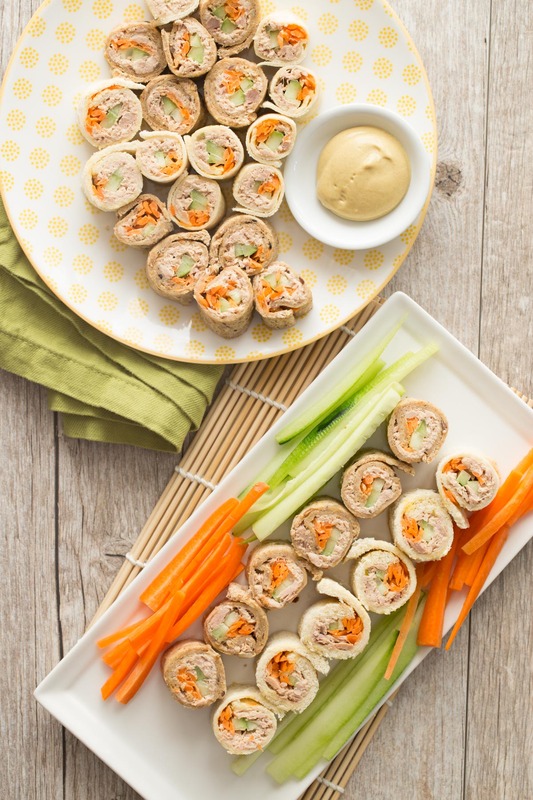 They are a fun take on a tuna sandwich crossed with a sushi roll (don't worry, there's nothing raw here). 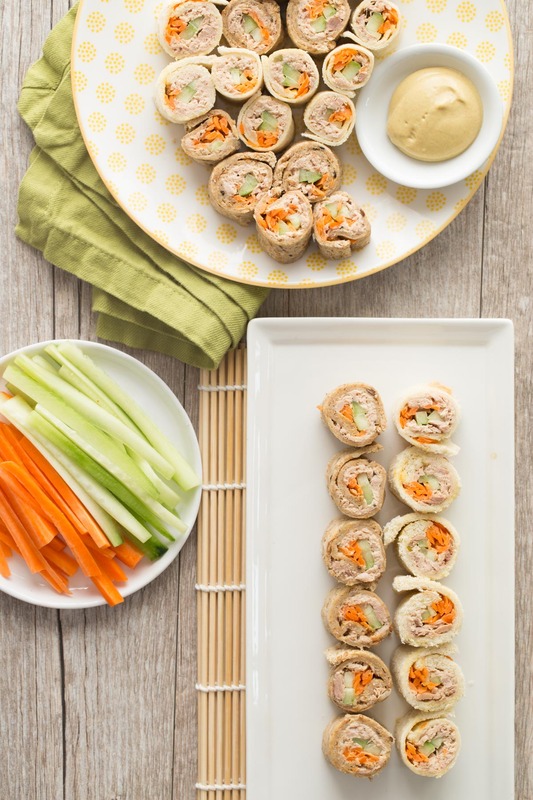 All you do is flatten your bread, fill it with healthy tuna fish salad, roll it up and then cut it into individual bites. 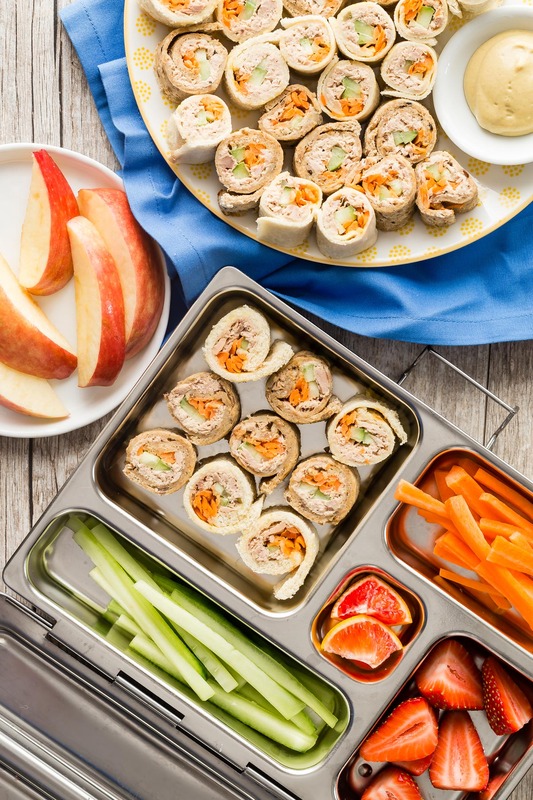 It's not only delicious, but an exciting treat that will impress your kids, be fun for them to eat and hopefully inspire you to keep thinking outside of the box -- the school lunch box, that is! 1. Cut the crusts off of each slice of bread and roll out as thin as possible with a rolling pin. 2. Place the tuna, capers, mayonnaise and dijon mustard in a bowl and stir to combine. 3. Place the long side of the rolled out bread closest to you. 4. Spread a thin layer of mayonnaise on each slice of rolled out bread. 5. Thinly spread 1/3 of the tuna mixture onto half of the bread lengthwise. 6. On top of the tuna mixture, arrange some of the cucumber sticks and grated carrot making sure not too over stuff the roll (a little goes a long way). 7. Starting at the side closest to you (the filled end) tightly roll the tuna/cucumber/carrot mixture up and press to seal into a roll (I dab a bit of mayonnaise across the end of the roll to act as a glue sealing the roll). 8. Cut the roll into 4 even pieces and repeat with remaining bread and tuna mixture. LOVE IT! You are so clever - way to go! These would be great for a birthday or Halloween party as well. I'm afraid to use tuna with my kids. Could you talk about why the mercury in tuna doesn't stop you from feeding to your children? Just curious...I don't know if I'm being overly cautious by banning it altogether. Thanks! I would love to make this for my daughter! We are a vegetarian household so I cant do the tuna but she loves cream cheese and avocado sandwiches...is there a way to include avocado slices without them turning brown through the day? This is an awesome idea for making a sandwich visually appealing and fun! Hello There. I found your weblog using msn. That is an extremely neatly written article. I will make sure to bookmark it and come back to read more of your helpful info. Thanks for the post. I'll certainly comeback. I use sandwich bread and roll it super thin! You have some amazing ideas and creative lunches. I only wish my daughter wasn't so picky. This is yet another fantastic idea! Thanks so much! Can't wait to try it! How many pieces are in one serving size? Is it one roll, or is the entire recipe made fo 1 serving? The nutrition information is for how many \"sushis\" ? 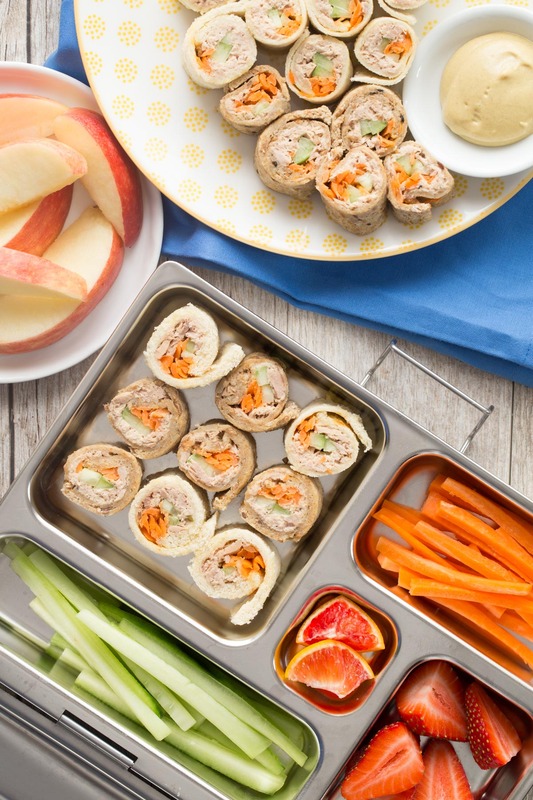 Love this idea for a quick, healthy and creative lunch for my kid! I wanted it to taste like sushi so after I rolled out the bread, I put a piece of seaweed on top and then canned salmon (mixed with mayonnaise and red onions), thinly sliced carrots, avocado, mango and apple. Came out colorful and delicious! Thank you so much for sharing! Catherine, have you ever made these the night before and do they go soggy or are they still yummey the next day? Thanks so much can't wait to try! They do get a bit soggy the night before, but not too bad. They don't get too soggy for my taste, but it would depend on how your child does with different textures.